January 30: This workshop is now full! Please contact Amy if you'd like to be on the waiting list. This workshop has been rescheduled from an earlier date. 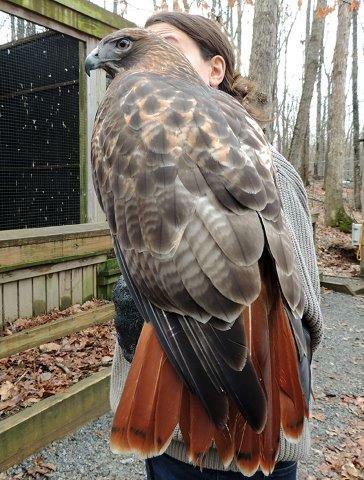 Come join us for a special painting workshop featuring Rosalie the Red-tailed Hawk as our model! The workshop will begin with a short presentation from Wildlife Center staff on Rosalie and her role as an education animal, then students will work with artist Amy Shawley Paquette to discover the basics of watercolor and illustration as well as learn fun and easy ideas for painting birds. We will have three 20 minute sessions with Rosalie present to draw and paint her from life and we will also provide photographs of her to use during the remainder of our painting time. After a short snack/lunch break, workshop attendees will be given a brief tour of the wildlife center. The workshop is open only to adults 18 and over (no children) with all levels of art experience and all workshop-use materials including paints, pencils, palettes, brushes, and surfaces will be provided! Please bring a sack lunch/snacks (if desired), a camera if you wish to take photos, and note-taking supplies. Please wear clothes you don't mind getting paint on or bring an apron. Workshop registration and payment must be completed in advance, and is done directly with the instructor - email Amy at amyshawley@gmail.com to coordinate payment and for details on her cancellation policy. Seating is limited so sign up early!